Wanna learn how to write and sell ebooks online -- quickly! This self-publishing ebook pack dispenses all the information you need to start making money writing and selling ebooks online. You can get started right away. Written by an author who's self-published over 50 ebooks and earns her living completely online. Writing and Selling Ebooks Online: The Ultimate Self-Publishing Package -- Get 4 Ebooks for 1 Low Price! Get the following four ebooks for one low price . . . .
Want to start your own ebook publishing empire? Think ebook publishing is hard? Have no idea how or where to start? Want to write an ebook but can never seem to make time to finish (or start)? You can! And by next week this time, you could have finished your first ebook and be well on your way to getting your first sale. I know, since 2010, I’ve made over half my annual income from e-products I wrote and promote. Read more. My ebooks sales sucked until I signed on with e-Junkie (sorry to be so blunt, but it’s the truth). But, once I signed up with them and created an affiliate program, I went from selling a few ebooks a month to a few per week; now, I make daily sales. Get full details. The average, VERY low cost for an ebook cover is in the $40-$250 range. And this is considered VERY reasonable. Higher-end prices can go from $995 on up to $5,000 or more. Really! This ebook teaches you how to create professional-looking covers yourself — in less than an hour — that help you sell more ebooks. It’s cheap, and quick and easy for anyone to do. Get full details. Less than 1% of those who purchase ebooks from Inkwell Editorial request a refund. I’ve been selling ebooks online since 2004 and went back through almost three years of records (and yes, my eyes are bleary from looking at all those numbers). In this ebook, I reveal what I found doing some industry research, how I manage to keep ebook returns below 1% — and how you can too! Get full details. Purchase these titles separately and you’d spend: $60.89. 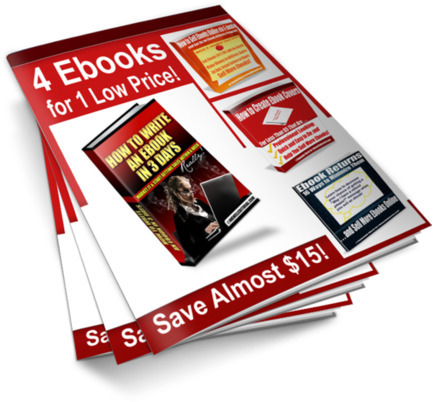 Get all four of these ebooks on self-publishing for just $47 – an almost 25% savings!